I’ve seen this story so many times. A tragedy occurs – politicians wring their hands and send thoughts and prayers, but don’t pass legislation that might help bring an end to such tragedies. Instead, they defend legislation that enabled the tragedy to occur in the first place. Only I’m not talking about US gun deaths and the Second Amendment. I’m talking about overpriced housing and the subservience of politicians to the finance sector, virtually everywhere in the developed world. The best way to do that is to give young people a government handout to let them climb onto the property ladder. A name evocative of concern for the young, such as the “First Home Buyers Grant” in Australia, or even more evocative, the “Help to Buy” Scheme in the UK, helps make the policy look worthy. This way, politicians are seen to be doing something to help the young, deflecting blame onto others (as they rail against rigid supply, which is not their responsibility), while actually fuelling the engine that drives house prices higher faster than consumer prices (and household incomes). That fuel is leverage – the rising level of household debt compared to income. Not only can politicians do something about this by changing the regulations on bank lending – they have done something about it in the past, by changing the regulations in ways that allowed this bubble to form in the first place. House prices only took off when politicians followed the advice of economists – and the special pleading of the finance sector – that the economy would work so much better if the heavy hand of government regulation was lifted, and industry was allowed to innovate. However, the innovations we got were not industrial but financial, as banks found ever more ways to persuade households (and also corporations) to take on more debt. Here the UK data is remarkable, even in the context of a worldwide trend to higher levels of leverage. Between 1880 and 1980, private debt in the UK fluctuated as a percentage of GDP, yet it never once reached 75% of GDP. 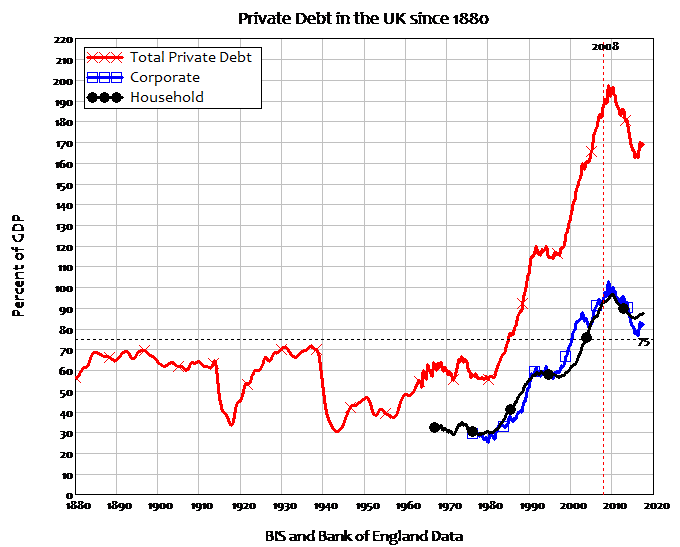 But in 1982, both household and corporate debt took off. In 1982, total private debt was equivalent to 61% of GDP, split equally between households and corporations. 25 years later, as the global financial crisis unfolded, private debt was three times larger at 197% of GDP, again split 50:50 between households and corporations. The key changes to legislation that occurred in 1982 is the UK let banks muscle into the mortgage market that was previously dominated by building societies. This was sold in terms of improving competition in the mortgage market, to the benefit of house buyers – allegedly, mortgage costs would fall. But its most profound impact was something much more insidious: it enabled the creation of credit money to fuel rising house prices, setting off a feedback loop that only ended in 2008. Building societies don’t create money when they lend, because they lend from a bank account that stores the accumulated savings of their members. There’s no change in bank deposits, which are by far the largest component of the money supply. So, far from tight housing supply being an excuse for national politicians to do nothing, it’s a reason for them to reverse the effect of the decision they made, decades ago, to let banks create money and inflate house prices in the first place. “Supply and demand” is a reason for politicians to act on the monetary demand side of the housing market (the following argument summarises an as yet unpublished technical paper by myself, Paul Ormerod and Rickard Nyman). The supply side of the housing market has two main two factors: the turnover of the existing stock of housing, and the net change in the number of houses (demolition of old properties and construction of new ones). The turnover of existing properties is far larger than the construction rate of new ones, and this alone makes housing different to your ordinary market. The demand side of the housing market has one main factor: new mortgages created by the banks. 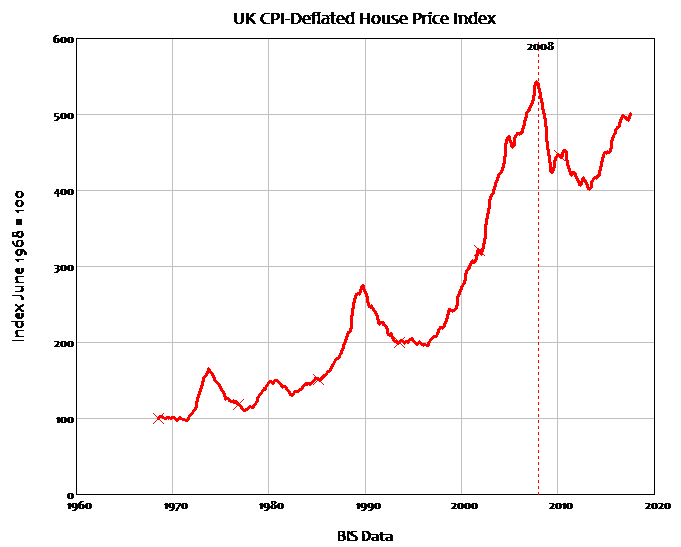 Monetary demand for housing is therefore predominantly mortgage credit: the annual increase in mortgage debt. This also makes housing very different to ordinary markets, where most demand comes from the turnover of existing money, rather than from newly created money. We can convert the credit-financed monetary demand for housing into a physical demand for new houses per year by dividing by the price level. 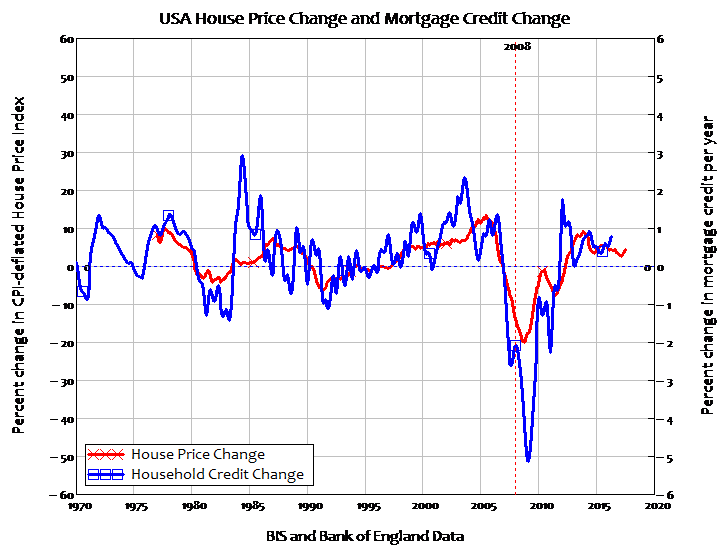 This gives us a relationship between the level of mortgage credit and the level of house prices. There is therefore a relationship between the change in mortgage credit and the change in house prices – this relationship is ignored in mainstream politics and mainstream economics. But it is the major determinant of house prices: house prices rise when mortgage credit rises, and they fall when mortgage credit falls. This relationship is obvious even for the UK, where mortgage debt data isn’t systematically collected – so I am forced to use data on total household debt (including credit cards, car loans etc.). Even then, the correlation is obvious (for the technically minded, the correlation coefficient is 0.6). The US does publish data on mortgage debt, and there the correlation is an even stronger 0.78 – and standard econometric tests establish that the causal process runs from mortgage debt to house prices, and not vice versa (the downturn in house prices began earlier in the USA, and was an obvious pre-cursor to the crisis there). The toxicity arises from the fact that the mortgage credit causes house prices to rise, leading to yet more credit being taken on until, as in 2008, the process breaks down. And it has to break down, because the only way to sustain it is for debt to continue rising faster than income. Once that stops happening, demand evaporates, house prices collapse, and they take the economy down with them. That is no way to run an economy. This should not be allowed. Instead, the maximum that lenders can provide should be limited to some multiple of a property’s actual or imputed rental income, so the income-earning potential of a property is the basis of the lending allowed against it. A hypothetically sustainable level is where the maximum debt secured against a property would be ten times the annual rental income, so a property rented for £20,000 a year would have a maximum loan amount of £200,000. Given that gross rental yields in the UK are between 4-6% (see: http://www.cityam.com/266735/uk-house-prices-best-and-worst-areas-buy-let-investments-uk), the price for such a property would fall into the £300,000-£500,000 range – with a maximum mortgage to price ratio of 67%, rather than the current 100% or more. The main function of such a rule would be to break the reinforcing cycle between debt and house prices that has given us globally over-valued housing and over-indebted households. Today, when two buyers compete for a property with identical incomes, the one who gets the higher level of leverage wins – giving us a strong and perverse incentive to actually want to be in more debt. Yet things would work very differently under this new approach – in a contest between two identical income earners over a property, the winner would be the one who saved a larger deposit. Of course, such a rule could not be imposed overnight: it would cause a house price crash which would result in a recession that would, in all likelihood, see the policy change reversed. However, it could be introduced at a higher level (say a 20:1 ratio) and reduced over time – used to transition us from a world in which we treat housing as a speculative asset rather than what it really is, a long-lived consumption good. This would need to be introduced along with other measures to wean the financial sector off its current role as an enabler of asset bubbles, and back to what it should be: a Servant of society, rather than its Master. Will it happen? I won’t hold my breath… but the next time politicians say there’s nothing they can do about house prices, suggest this new approach and make them squirm. PS. You can see more of Professor Keen’s work – and support him – via this crowdfunding site: https://www.patreon.com/ProfSteveKeen.